On a road trip back home. I stopped in at a Northern Florida Orange stand/convenience store. Walking around this store where I could have bought a gator back scratcher or a huge pecan log (yummy) tasting wonderful grapefruit meandering through the aisles. 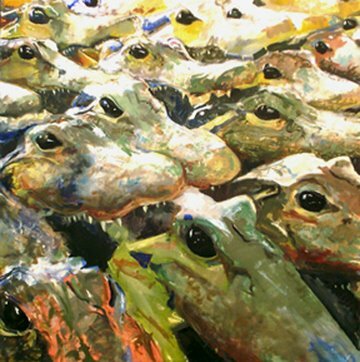 I was stopped by this crazy display; hundred of alligator heads!! My first thought was of the slaughter house for this. The image continues to be visceral in my mind and yet there they were with beautiful sunlight coming through this window. They seemed ha ha almost happy to be there!!! I tried to convey that with my choice of colors.